The year is 1993. First-year reporter Evie Jones is haunted by the unsolved 1982 murder of her best friend, Lianne Gagnon, back when the girls were both eleven. The suspected killer, a repeat offender named Robert Cameron, was never apprehended. Now twenty-two and living alone for the first time, Evie is obsessively drawn to researching the real story of who killed Lianne. She leans on childhood friend David Patton for help, but every clue they uncover seems to lead to an unimaginable conclusion. As she gets closer and closer to the truth, Evie becomes convinced that the killer is still at large--and that he’s coming back for her. In the wake of Paul Bernardo’s arrest for a double murder, and a case of identity theft that seems to point to Robert Cameron himself, Evie is stalked by a strange man who stands out on her fire escape night after night, watching her every move. Has her anxiety simply taken over? Or can Evie somehow be drawing the killer closer to herself? Only a harrowing last visit to see David’s father, Graham, provides the answer Evie has been so desperate to find--the trail that leads from Patton to Cameron to eleven-year-old Lianne, and ultimately to Evie herself. I came across The Devil You Know when I was creating my list of books for Reading Bingo. This book would have covered the "Thriller/Mystery written by a Canadian author" square. It has been sitting in my Kindle TBR list for a few months now and the chance to finally read it came up. What drew me to this book was its mention of the Paul Bernardo case. I grew up and lived in Scarborough most of my life. So, the stories and news that the Bernardo case left in its wake popped up in several conversations over the years. It was interesting to see how the stories of Bernardo could have affected the mindset of the journalists and media working on his case. From this book we get to see how Evie is affected by the news and sleepless nights. There were many instances in this book that had me looking over my shoulder. The creep factor in these scenes are very high. There are many occurrences where Evie, the book's main character is alone and her mind often wanders leading her to believe that there is someone in the room with her. Whether she's working late at her office, down in the paper archives or at home after a long day she is constantly feeling like she's being watched. 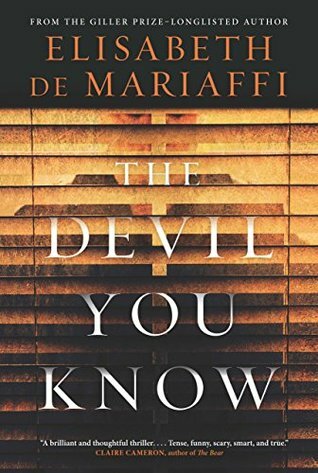 The Devil You Know was a great thriller and mystery novel. It is very dark and anyone who has trouble reading about issues surrounding violence, specifically against women, may have trouble reading this. Though none of the details are graphic, the creep factor in a few of the scenes is enough to get some readers on edge. For me, this book would have propelled to a 5 star novel if the story did not drag as much. I found a couple of the chapters to be filled with some details that could have been cut out and helped move the story along quicker. I would recommend this book to those who enjoy Canadian literature and mystery novels. The book has tons of local Toronto and St. Catharines details that residents and visitors can appreciate.